Crossing the Danube A new book highlights the glories of the Danube’s bridges and reveals the architecture and inspiration that make these beautiful structures a part of the character and culture of the Danube. Bridges link cultures while they span the length of our imagination. they reflect back to us the strengths and aspirations of our societies. A new book by photographer peter gyukics, to be published this autumn, showcases the beautiful bridges of the Danube river. Peter Gyukics had been photographing roads and highway constructions for years when he became interested in bridges. He was working with engineer Margit Schulz when he was captured by the form and structure of a railway bridge that he’d never noticed before. “This was the breaking point for me,” says Gyukics. “I started to pay attention to all the bridges that I passed, and took photos of them all.” Gyukics’s fascination with bridges, he says, comes from their invisibility. “Bridges are part of our everyday life, but we don’t notice them at all, we only use them. Bridges fade into the landscape, and even if they stand out from it they still emphasise the nature surrounding them,” he says. And it is their usefulness that makes them beautiful, “especially when functionality and the most recent technological knowledge of the era are fused in them”. Putting a passion into print. Later Gyukics met bridge historian Ernő Tóth, author of several technical books. “He told me about an old dream of his”, says Gyukics. “He’d always wanted a book which is not full of technical schemes, tables or text, but with lots of pictures about bridges.” No such book existed then, and Gyukics and Tóth decided to collaborate to create a photo book of bridges. Gyukics took photos of the 151 most important Hungarian bridges (of the country’s 27,000 bridges), and Bridges in Hungary was published in 2005. After the book’s great success – it was so popular among bridge specialists that there were no copies left for bookstores – Gyukics turned to ‘the favourite river of Hungarians’, the Tisza. 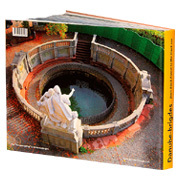 This second photo book, Along the Bridges of the Tisza River, was published in 2007 and presented all the bridges of Tisza River and 72 interesting monuments with technical and historical facts. The diversity of the Danube. According to Gyukics, what makes the Danube’s bridges so special is their variety. The very first bridge on the Danube was built out of stone in Regensburg, Germany, in 1146 (Regensburg’s Stone Bridge) and is still standing. The second permanent bridge is the Széchenyi Chain Bridge in Budapest – a suspension bridge made from stone and steel. Today most bridges are made from reinforced concrete. Contrary to what one would think, Gyukics says, this doesn’t mean uniformity. “All bridges are unique. They have the energy to concentrate on the perspective even after the great technical planning and construction work.” And there is much to see for those who cross the bridge – fine sculptures, balustrades and memorial tablets. “In Binzwangen, Germany, we can find a 200 to 300-year-old baroque sculpture near the bridge, and a 20th-century sculpture of St. John of Nepomuk on the same bridge!” bridging identities. The Danube winds through varying landscapes, diverse regions and countries, and Gyukics’s journeys photographing the river’s bridges have introduced him to people from all walks of life. “Today it’s not astonishing to see a Canadian and a Hungarian having a conversation in the 400-year-old post office restaurant of Immendingen and when the owner joins the conversation they switch from English to German. Even without any common language, the local people are very open.” Bridges are powerful metaphors for Gyukics, and he is confident that the Danube Basin might be the region to lead Europe to change. “If we utilised our natural resources more efficiently and developed closer cooperation it could help us to make the first steps towards change,” he says. “We need great minds to turn our ship in the right direction”. It is no surprise that Gyukics finds inspiration from a leader in bridges and navigation: Hungarian Count István Széchenyi recognised the importance, for Hungary and the entire region, of regulating the Lower Danube and worked to open the region for steamers and railway traffic. The Széchenyi Chain Bridge, linking Buda and Pest for the first time, was named for the Count. “He patronised science and contributed to the economic development of the country by his books and his social and public activities,” says Gyukics. “He condemned – by his words and his work – extreme nationalism.” Perhaps Széchenyi’s life can inspire the next generation of leaders needed to bridge Europe and the Danube River Basin. 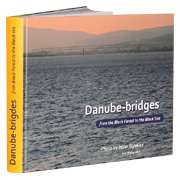 For more information or to order a copy, please visit: www.danube-bridges.com. Kirstie Shepherd is a freelance journalist living in Vienna and has called the Danube River Basin home since 2000.